Royale Print Gowns... Look Good, Feel Good! 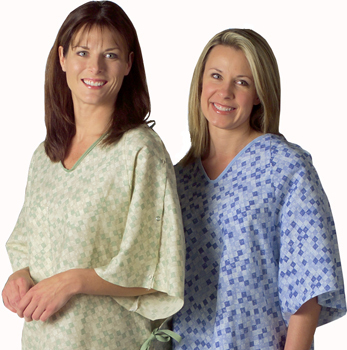 Our two newest gowns are a take-off on our popular “Healing Colors” collection. By using shades of beige, sage and blue, these gowns were designed to look less institutional. The new Royale Print is available in both an I.V. 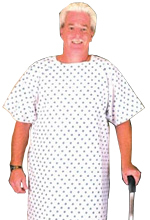 style patient gown as well as a regular patient gown. The Royal Print I.V. 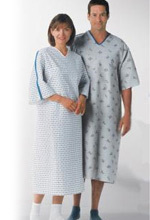 gown is in an earthtone color scheme of beige and sage and the regular gown features the same print in different shades of blue. 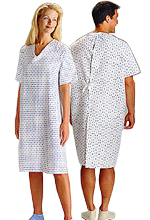 Both gowns offer an attractive, fashion forward print that patients will find refreshing. 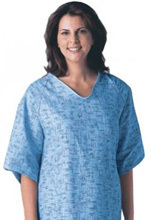 Gowns are generously cut with a 66'' sweep and a tieside closure provides complete patient modesty. Patients will appreciate the 49'' length and 5'' in-sleeve. I.V. 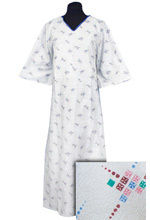 gown with telemetry pocket-Beige and Sage Royale Print. 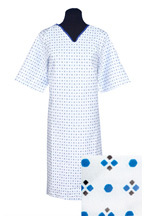 Patient gown-Two-tone blue Royale Print.